First day of the 2018 Royal Ascot witnessed some tough competition, but in the end, it was wrapped up with a win by Frankie Dettori. 47-year-old jockey made his impressive return after suffering an injury last year and being unable to compete. Dettori is now taking the race by storm and riding high on his spectacular victory. The Duke and Duchess of Sussex personally congratulated the winner and presented him with the coveted trophy. Frankie Dettori might've won the race, but the highlight of his day was getting an opportunity to meet Prince Harry and Meghan Markle and giving the duchess a cheeky kiss on her hand. 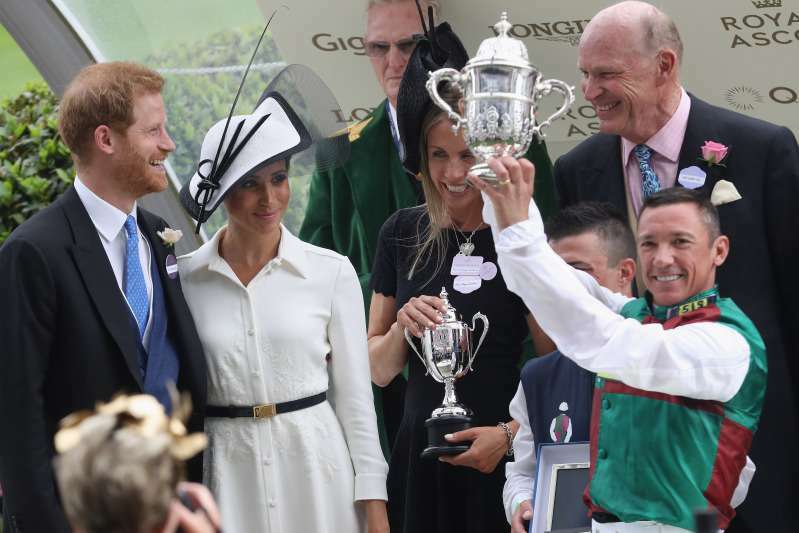 Dettori planted a peck on Meghan's hand while being carefully watched by her less than impressed husband. Public noticed Harry cracking a smile only when Frankie let go of his wife's hand and raised his trophy in the air. However, we're sure that the Duke of Sussex doesn't hold a grudge against the jockey, he's just being a protective new husband, which is very sweet. People were entertained by the situation but were more taken by Harry's loving look at his darling wife. — Karl White (@karlthomas85) 19 июня 2018 г. Why did he want kissing too? — 🇬🇧steve🏴󠁧󠁢󠁥󠁮󠁧󠁿 (@Sdc_cabbie) 19 июня 2018 г.